Montezuma's Revenge is a video game for Atari home computers, Atari 2600, Atari 5200, Apple II, ColecoVision, Commodore 64, IBM PC, Sega Master System, and ZX Spectrum (as Panama Joe). It was created by Robert Jaeger and published in 1984 by Parker Brothers. The game's title references a colloquial American English expression for diarrhea contracted while visiting Mexico. 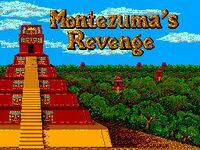 Montezuma's Revenge was one of the first platform games: an action game combining treasure hunting, multiple rooms, and puzzle solving. The player commands a character called Panama Joe (a.k.a. Pedro), moving him from room to room in the labyrinthine underground of the 16th century Aztec temple of emperor Montezuma II, filled with enemies, obstacles, traps, and dangers. The objective is to score points by gathering jewels along the way. Panama Joe must find keys to open doors, collect and use equipment such as torches, swords, amulets, etc. without losing his life. Obstacles are laser gates, conveyor belts, disappearing floors, and fire pits. Movement is achieved by jumping, running, sliding down poles, steps, chains, etc. Enemies are the skulls, snakes, and spiders. A further complication arises in the bottommost levels of each pyramid, which must be played in total darkness unless a torch is found. Source: Wikipedia, "Montezuma's Revenge (video game)," available under the CC-BY-SA License.